If you’ve ever watched a movie on a plane, you’ve probably seen a message like “This movie has been edited for content” pop up before it played. Ever wondered what it meant? Let’s find out. Since there are no major laws to follow, it is down to the airlines themselves what gets shown. Sometimes, different airlines end up with entirely different cuts. The film Carol, a drama about a lesbian couple in the 50s, was edited to the point that the couple didn’t even kiss on Delta flights but was completely unedited on United or American Airlines. Even though airlines censor movies, they probably aren’t censored very much. For the most part, airlines don’t usually run movies from which they’d have to remove too much content; it’s better just to offer other, less edited, movies instead. 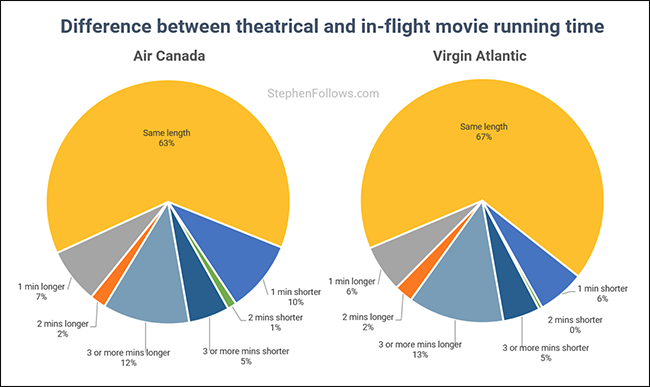 Stephen Follows conducted a bit of research into the runtime of theatrical releases vs. airplane releases. He found that 65% of the movies were the same length in both versions. Only 14% were shorter (with the majority of those being less than a minute shorter) while 21% were longer, presumably because they were director’s cut or extended editions. Follows’ study only includes Air Canada and Virgin Atlantic, airlines based in liberal Western countries, so they’re probably pretty light on the censorship to begin with. Editing is probably a bit more heavy-handed on airlines in less liberal places. The big takeaway is that if you want to watch something sweary, violent, and R-rated—hey Deadpool—you should probably catch it in the cinema. On the other hand, if you’re watching a drama or comedy, there might be some small differences, but they’re unlikely to affect the plot overly. Seatback screens are on the way out. Instead, airlines like United are offering wireless movie streaming to your smartphone or tablet. The big advantage to the airline is it’s way cheaper. Inflight entertainment systems are comically expensive—according to CNN, it’s about $5,000,000 in hardware plus an additional $3,000,000 in fuel costs per year to carry the hardware—so getting customers to use their own devices that they’re carrying anyway is a simple out. The big advantage to the customer is that watching a movie on your phone or tablet is a much more private experience, even compared to watching a movie on the screen attached the seat in front of you. 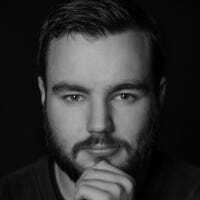 According to Amir Samnani, the Senior VP of Content Services for Global Eagle, in an interview with Dave Roos for How Stuff Works, airlines can be “a little bit more lenient.” Instead of editing for content, they display something to the effect like “This movie has content that may be unsuitable,” and leave it at that. Movies are one of the few saving graces on a long-haul flight. I, for one, am glad that they’re generally not too butchered by overly puritanical airlines.